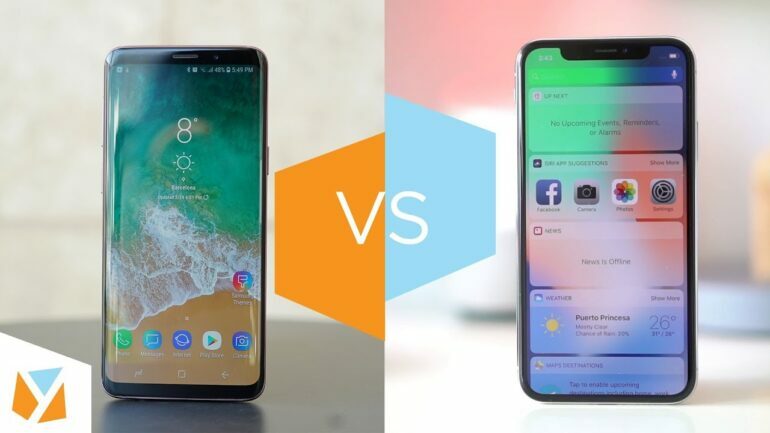 Ever since it was announced and then released, the iPhone X reign supreme in the high-end market for Smartphones, until, that is, Samsung came out swinging with the release of the Samsung Galaxy S9. Samsung Galaxy S9 and the S9 Plus are at the top of Samsung’s new slate of smartphones because they are more attractive, more modern, and have an eye-catching design that is the envy amongst it siblings and rivals. But the iPhone X does too, after, it is Apple’s most wild and different handset, a true change in the direction that we were used to from the Terminals made by Apple. Both the iPhone X and the Galaxy S9 share a seemingly bezel-less display, which means, that practically the whole front of the Phone is the entire screen, with little space given to the frontal cameras, sensors, mic, speaker, etc. And that puts the two flagship smartphones at the head of the high-end market race. Let’s begin the most external and more obvious differences, the iPhone X is available in two different colors, Silver and Space Grey. The Galaxy S9, on the other hand, comes in Orchid Grey, Coral Blue, Midnight Black, and Lilac Purple. Now, getting deep into the more emblematic differences, FACE ID/FACE SCANNING, this time around, Apple has removed entirely the Home Button from the iPhone X, which is where in previous models they kept the fingerprint scanner. So, instead of doing the obvious, and like many other recent Android Models including the Galaxy S9 of moving the scanner to the rear of the Phone, normally under the camera, they have decided to remove the sensor completely, leaving the biometrical security on the hands of the Face ID. Camera wise the iPhone X comes out winning, having a dual lens camera, offering portrait mode, and Portrait Lighting. The Galaxy S9 only has a single lens camera, however, if you want to enjoy the dual camera, then you must buy the Plus version. On the inside, the iPhone X uses an A11 Bionic Chip with 3GB RAM, while the S9 uses an Octa-Core Exynos 8910 and 4GB RAM.